“There’s nothing that gets the blood pumping like playing in a big tournament, so we’re thrilled to reveal the good news about the upcoming GGPoker Masters to our players,” said Paul Burke, Head of GGPoker. 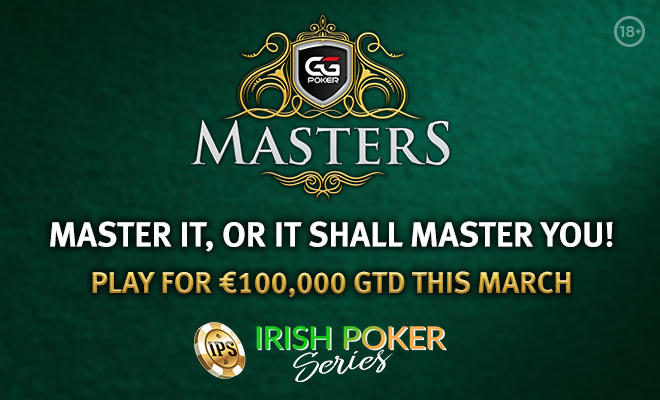 GGPoker announces details of its €100,000 guaranteed GGPoker Live Masters tournament, which will take place in March 2019 and is run in partnership with the acclaimed Irish Poker Series team. We feel players are tired of lots of flights, lots of re-entries and very little play. We want to bring back a purer form of the game – more play and more skill! Therefore, the GG Poker Masters only allows one bullet per flight! This means if you bust day 1A you cannot re-enter into 1A but you can play 1B once. The main event features a €350 buy-in and boasts four Day 1 flights; two online (Day 1A on Sunday, March 17 and Day 1B on Thursday, March 21) and two live (Day 1C and Day 1D both taking place on Saturday, March 23). The GGPoker Masters will conclude with Day 2 on Sunday, March 24 and will also be supported by various side event tournaments. The CityNorth Hotel in Dublin, Ireland, which is located within 25 minutes of Dublin Airport, will play host to Day 1C, Day 1D and Day 2 of the GGPoker Masters. said Brian Lannon of Irish Poker Series. The satellite qualifiers gives all players the ability to participate in what will be a fantastic event. Players that win GGPoker Masters Day 1 tickets can use them to register for their preferred Day 1 flights, with all flights featuring re-entries.